Banasawadi is a very good location. It is well connected to HRBR Ring Road, near Manyatha Tech Park. Thambuchetty Palya is one of the popular localities in Bangalore North having 9 apartment projects , 1 villa projects Some of the popular residential builders in the TC Palya are Shree Renuka Builders, Virani Builders & Developers, Bsr Constructions, Purple Estate And Holding Pvt Ltd, Jana Jeeva Estates Pvt Ltd,Innovative Builders And Developers, Yd Builder, Hebron Properties Pvt Ltd, Sri Builders & Developers. HBR Layout is a very good location. 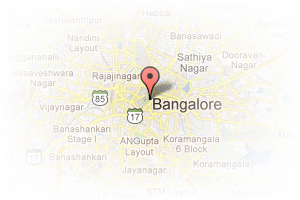 It is well connected to almost all the important places of Bangalore. It is near to schools, malls, hospitals and shopping complex. Address: NO 127 11 th cross Road, Lingarajapuram, Bangalore, Karnataka, India. This Builder Profile page for "Aim 2 Reach Pvt Ltd" has been created by PropertyWala.com. 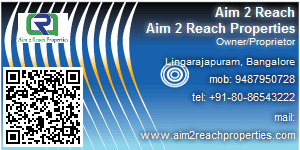 "Aim 2 Reach Pvt Ltd" is not endorsed by or affiliated with PropertyWala.com. For questions regarding Builder Profiles on PropertyWala.com please contact us.